The weather just took a turn for the colder, the leaves are nearly gone, and the days seem darker and darker. Hallowe'en is coming, we can smell it in the air. It's not all spooky though: our houses are getting warmer, we've pulled out the wool sweaters and fleece-lined leggings, and Thanksgiving's leftover mulled wine warms the hands and the heart like nothing else. Here at The Flower Pot we like to mix it up, a bit of Hallowe'en's spooky spirit and the warmth of past Thanksgiving festivities. 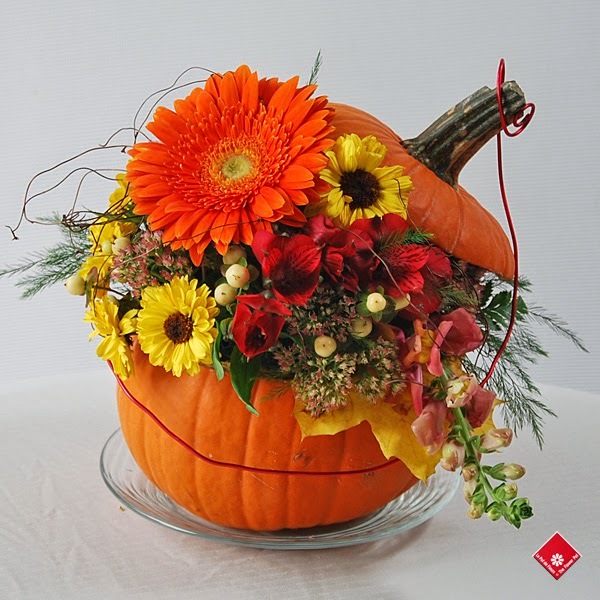 Take this Pumpkin Riot for example: the great pumpkin that we've carved out like a jack-o-lantern and stuffed full of bright fall flowers will warm your household décor. We have many great décor ideas, including the new "it" wall-art piece, photos printed on acrylic or plexiglass. The high fidelity printing makes colours pop, just like fall leaves. It's the perfect medium for a family photo hanging over a crackling fire. Contact us by phone 514-938-1234, email, or drop by for a friendly chat and professional advice about arrangements, wall art, or gifts from your local Montreal florist The Flower Pot.